Creating a resume, applying for jobs, asking for letters of recommendation – when applying for a job, the list of items to check off before getting your foot in the door can be daunting. But once you’ve landed the job of your dreams and received your first paycheck, it can be confusing to decipher what each line item means and where your money is going. To clear up the confusion and help you understand your first paycheck, we’ll discuss pay schedules and unfamiliar terms commonly seen on paychecks. 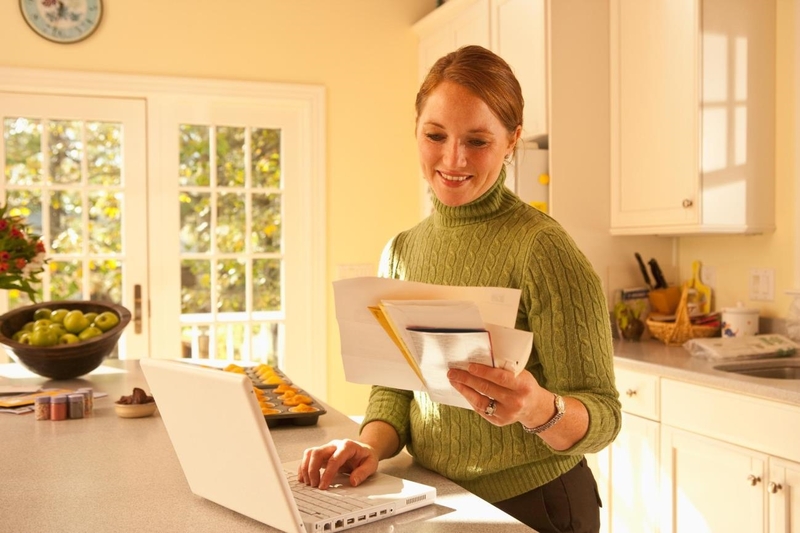 Common pay schedules include monthly, weekly, bi-weekly, or semimonthly, according to the Bureau of Labor Statistics. Where an individual works and which state they live in affects which pay schedule their organization uses. Upon being hired, the human resources department or an employee’s manager will relay how the company’s pay schedule falls. Although paychecks might differ slightly, they are typically broken out into two major sections: wages and deductions. Gross pay is the amount of money earned during a specific pay period before deductions and taxes are taken out. 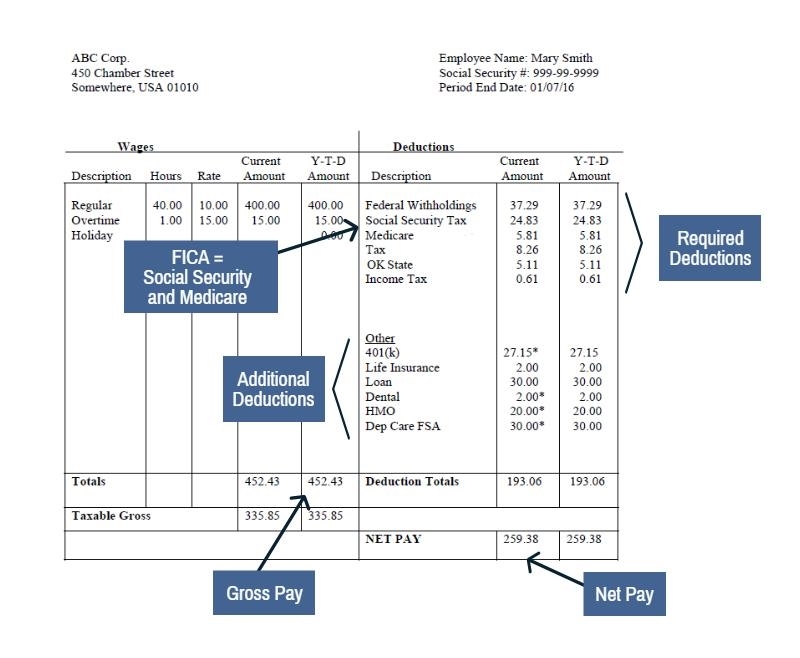 Net pay is the total amount of money an individual would “take home” after deductions and taxes are taken out. Year-to-date pay is the total amount of money an individual has earned since the beginning of the calendar year. These numbers can be shown on both the wages and deductions sections of a paycheck. When an employee begins a job, he or she completes a W-4 form that determines the amount of money that will be withheld from each paycheck for taxes. The federal income tax is also dependent on an individual’s tax rate. The state income tax is the amount of money withheld from each paycheck depending on the state where an individual lives. To view the Oklahoma state withholding tax allowance amounts, visit the Oklahoma Tax Commission website. Federal Insurance Contribution Act taxes, commonly referred to as FICA, are payroll taxes that an individual’s employer is required to withhold from gross income. FICA is comprised of Social Security Tax and Medicare Tax, and these can be listed out separately or joined together. Social Security tax is withheld from all individuals’ paychecks, is part of FICA, and is used to fund Social Security, which pays for retirement and disability benefits. Medicare tax is withheld from all individuals’ paychecks, is part of FICA, and is used to subsidize health insurance for individuals 65 and older. A paycheck may also have other deductions if an individual has elected for insurance or retirement plan contributions, such as 401(k) or 403(b), which are pretax deductions. After tax deductions such as Roth 401(k) can be deducted as well. For those still needing help with understanding their paycheck and where their money is going to, our paycheck and benefits calculators answer questions such as how payroll adjustments affect take-home pay, converting hourly wages to an equivalent annual salary, and what 401(k)s may be worth. For additional help or to speak with our team at Capital Asset Management, Inc. about how we can help you manage your financial future, give us a call today.